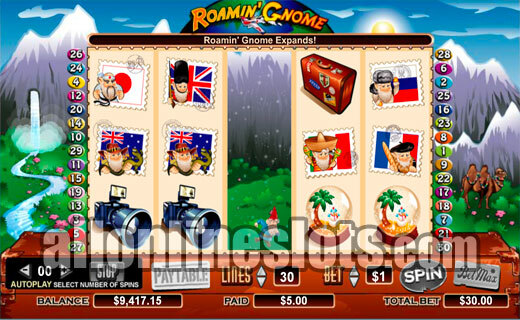 Roamin' Gnome is a travel theme slot by Cryptologic. It has a free spins bonus as well as a reel based feature where a Gnome above a reel activates a wild reel bonus. Top jackpot is 10,000 coins and max bet comes in at 30 coins. There are countless stories of people who kidnap other peoples garden gnomes and then send them on a vacation while sending the owner photographs of their gnome in various destinations. 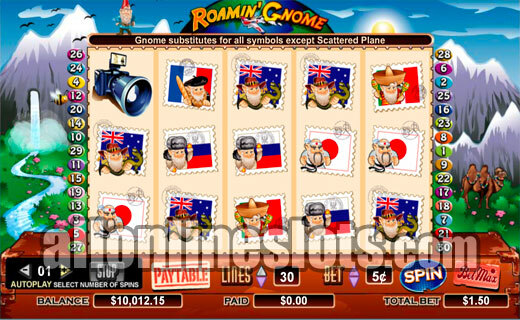 The Roamin' Gnome video slot is a tribute to these adventurous garden gnomes! 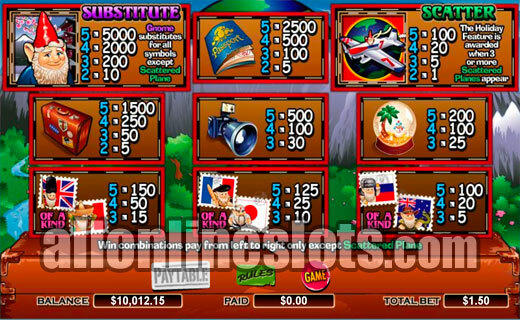 The game uses the Cryptologic 5 reel, 30 line format and has a 30 coin maximum bet. Coin sizes start at 1c and go as high as $20. 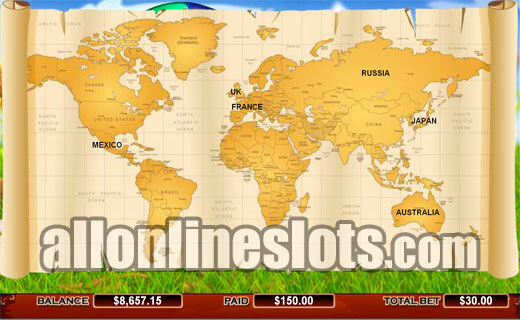 We suggest that you always play all lines to give you the most chances of winning on every spin. At the lowest coin size max bet is just 30c per game. 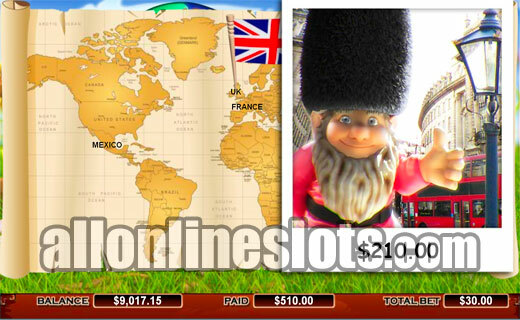 The Gnome symbols are substitutes and act like a joker for everything but the plane symbols which are scatters Getting five Gnome symbols on a line awards the top pay of 5,000 times your line bet. There is an interesting twist with the Gnome symbols as they can expand to take up the whole reel. On top of the reels is a small Gnome which just from reel to reel on each spin. If the small Gnome appears above a reel where a wild Gnome symbol appears that whole reel turns wild. This can make it easier to get the bigger pays although it seems that the designers made a minor mistake. The feature always activates even if the expanding wild symbol will not give any more wins. This can be a little annoying as you have to wait for the animation of the expanding wild before you can continue. Chances are the designers will fix this when they get a chance. The scattered plane symbols activate the Holiday Feature. Get three or more and you move to the map stage. Here you can select three destinations on the map to decide where you will send the Gnome. (View Screenshot). Once you have selected 3 you get postcards from each destination. These postcards reveal either a random prize or a free spin amount. After the wins are revealed any credit wins are paid and any free spins won are activated. All free spins pay double their pay table values so the top jackpot on the spins grows to a nice 10,000 coins. Overall, Roamin' Gnome has a humorous theme, with a bonus feature that will put a smile on your face. The slight problem with the expanding wilds should not put you off playing this top quality video slot. .